They’re sweet, tangy, crunchy—pickles are simply awesome! They add that sharp surprise every time you bite into our barbecues and burgers. But there’s really more to pickles than good barbecue. And perhaps there’s no one else around who knows them more than Brisbane-based pickle expert Mikey Hilburger of Picklehead Pickles! Mikey embraced the tartness of pickles from a young age, which eventually turned into an obsessive love for the food product. And like the rest of us, he also believes pickles and barbecue are destined for each other. “Pickles are a great foil for barbecued meats; the astringency helps cut through the fat and they have a great crunchy texture,” said Mikey. Through travelling, he was able to taste pickles in many forms that motivated him to come up with his very own concoction. After tinkering with an old family recipe, Mikey created the best-tasting dill pickles now popularly known as Picklehead Pickles. The secret to his delicious pickles: the best locally sourced ingredients and no nasty additives. Spreading the pickle love since 2012, Mikey aims to increase the number of people having the best pickles on their meals. “We have converted so many people who’s only experience was that rubbish on a Maccas burger,” Mikey proudly noted. 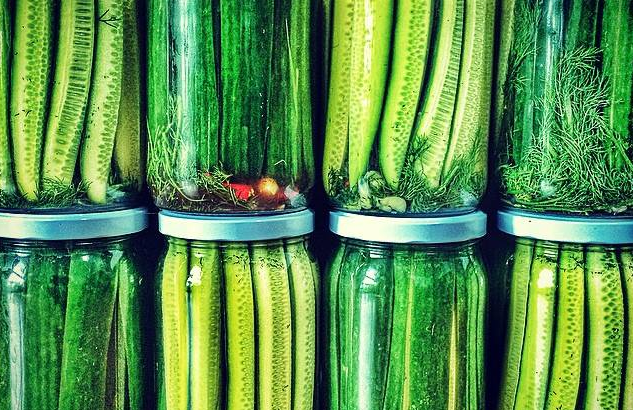 If you want to learn more about Mikey’s pickling secrets, do catch him at our Canned, Pickled, and Preserved workshop! Mikey Hilburger loves his dill pickles. And it definitely shows! Here are are more creative ways to enjoy your jar of pickles up to the very last drop, according to Mikey. “I love to add finely diced dill pickles to a potato salad as it gives a nice crunchy, sour nugget to an otherwise creamy, often bland dish,” said Mikey. It works for your egg, chicken, tuna salads, too. Fill an ice cube tray with pickle brine, stick toothpicks into each mould, then pop it in the freezer. These are the perfect pick-me-up on a lazy afternoon! Run out of vinegar or fresh lemons for the vinaigrette? Use pickle brine instead. Serve your party guests with something new and stir in pickle brine in their martini and Bloody Mary. Better yet, plan a surprise happy hour treat and have shots of pure pickle brine ready! Fried pickles may sound outrageous but they actually make great party appetisers. And we all know how quick it is to fry foods covered in batter (they disappear rather quickly on the plate, too). Chips and veggie sticks for a snack is made even better when dipped on creamy hummus with pickle and brine. Better yet, serve this delicious dip with baked pickle chips. A good way to make use of both dill pickles and brine is to add them into chicken broth, cream, and vegetables to whip up a pot of dill pickle soup. Sipping something strong and tangy is definitely something to look forward to on cold, winter months. If pickles work for burgers, then it’s just natural that they’re great on pizzas, too. The tangy bite of pickles is perfect for counteracting the richness of a quattro formaggi! Images provided by Mikey Hilburger. Find Picklehead Pickles on facebook.com/pickleheadpickles.